← Unbuntu and a Viliv S10 Blade…? Since the part 1 of The Laughing Tree, Helena and I have officially launched the site with very nice results. The store and logo appear to be a hit with her customers and friends. 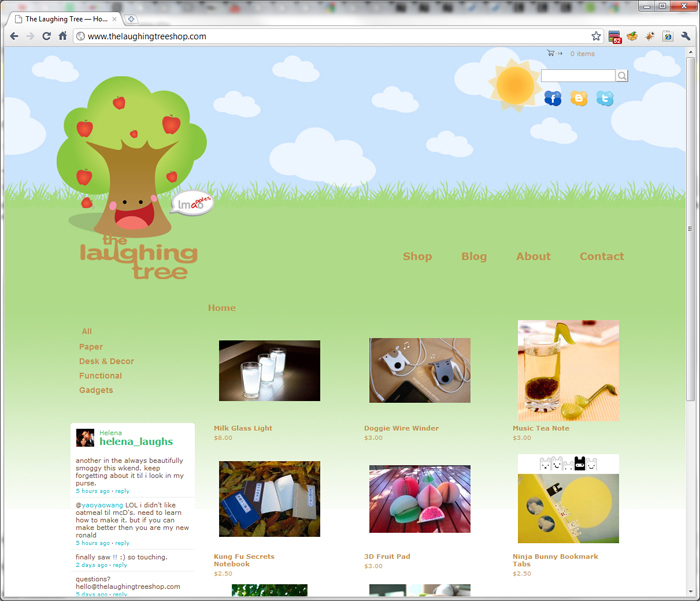 You can also “laugh your apples off” at thelaughingtreeshop.com now officially open for business. This entry was posted in Freelance and tagged android, freelance, google, helena li, kevin c kwok, kevin for google, kevin kwok, kevinforgoogle, kevinforgoogle.com, kevinkwok.com, laughing tree, the laughing tree, thelaughingtreeshop.com, twitter, website. Bookmark the permalink.